Natural remedies are the better choice. Aries utilises effective natural essential oils to fight vermin. Most of Aries products use neem extracts, extracted from leafs and seeds of the Indian neem tree and which is completely harmless to the human body. But should insects nosh from it, they will be killed. Aries offers a wide range of scents that vermin does not at all like. This is how mosquitoes, moths, ants, flies, ticks or snails are kept in distance by scents that one may consider as convenient. Insects on their side got means of information exchange on their own. Wasps, for example, which are accordingly sprayed on carry the inconvenient information to their colony. This avoids unwanted visits of the extended family. Ticks and moths do not like cedar oil, while snails can not stand lavender oil. 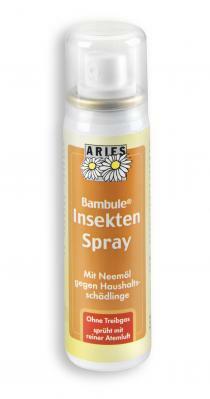 Aries has got a defensive scent for any vermin.